Bible 100 is the entire Bible, Genesis to Revelation, in 100 minutes. Help your congregation learn the Bible faster than they ever thought possible! You want your congregation to read the Bible more. People say they want to read it more, but they find it overwhelming or they're just too busy. Bible 100 is perfect for the busy person in your congregation who is overwhelmed by the length of the Bible. 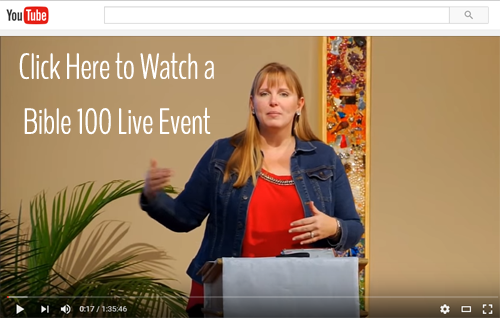 Bible 100 is a comprehensive overview, but we do it in only one session. No need for a multi-week commitment! Imagine it, the entire Bible in only one session! Invite people to your church for a 2-hour workshop. We’ll go through the entire Bible, Genesis to Revelation, in only 100 minutes and have time left over for questions. Watch Bible 100 here for free. Contact Beth to coordinate a date. Reserve a room at your church. Publicize the event (click here for a free flyer). Confirm expected attendance at least 3-days in advance. To purchase the complete Bible 100 course for yourself (audio, workbook, and slides) visit our store.